Finally made troop #3 - COSI After Dark: May The Fourth Be With You in Columbus, Ohio. 5/4/18 For those who don't know, COSI stands for Center of Science & Industry and is an interactive center that is very popular with kids and adults. The COSI After Dark is a 21+ monthly themed event series with food and cash bar and they have a yearly Star Wars theme one that is a blast. Most fun I've had trooping yet! 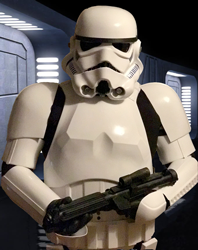 There is the Anovos Stormtrooper Kit Building Group, TK Armor's Costuming Group (specific to AM Armor), WTF: Walt's Trooper Factory and tons more. Walt has some good helmet building videos and Eric Dyck has posted some great videos on assembling helmets in various groups, but he's easily found on the TK Armor page. I enjoy hearing ideas and opinions on different armors and seeing people build their kits, so I join new groups all the time. Once you join one, it seems Facebook likes to suggest others. 2 - Battlefront II Midnight Release at Game Stop in Circleville, Ohio. 11.16.17 Just like the first one, new friends were made! The staff was awesome and even the folks coming in for Pokemon instead of Battlefront II wanted pictures with us.